In Russia he has become a focus of accusations that "fascists" and extremists control the government in Kiev. However, Mr Yarosh received less than 1% in presidential elections, and his party failed to pass a 5% barrier to enter parliament - though he himself was elected as a deputy. Russian media were quick to condemn the move. "Neo-Nazis are strengthening their positions," proclaimed Russia's state-owned Rossiya 1 TV. "Radical armed groups will become a separate assault brigade, led by Yarosh." Russia accuses him of incitement to terrorism and at Russia's request he is listed as wanted by Interpol. He denies the charges. "He is a nationalist - though there is a discussion, among experts, on whether labels like 'ultra-nationalism', 'fascism' or 'extreme right' should be applied to him," wrote Andreas Umland, an expert on the far right in Ukraine. Mr Umland points out that Mr Yarosh, unlike many other far-right activists, defines nationality according to citizenship. That is, not just ethnic Ukrainians are considered to be, so to speak, "true Ukrainians", but Russians, Jews, Tartars or any other group living on Ukrainian territory. That said, Mr Yarosh's political beliefs fall firmly to the right of the political spectrum. "In the past, he has made critical statements about Western liberalism and European integration," Mr Umland said. Mr Yarosh's appointment could simply be a bit of canny public relations: the promotion of a popular combat leader, one who received serious injuries in the battle of Donetsk airport and was subsequently photographed, bruised and bandaged in his hospital bed. The big question is what his position portends for the future of the volunteer battalions, which previously operated free of direct government control. Now, however, Ukraine's leaders are making concerted efforts to limit their autonomy. 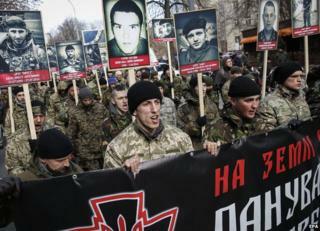 Right Sector was the last prominent battalion to resist joining a government structure. Now, officials said the group would "submit to the military leadership over questions of national defence." That is also significant, given that it potentially removes Right Sector from under the influence of the Ukrainian billionaire, Ihor Kolomoisky. Mr Kolomoisky showed himself willing to use armed groups in what appeared to be a power struggle last month with Kiev authorities. But the extent of their subordination to the government could also be open to debate. A Right Sector spokesman was quoted as saying that his organisation would now be funded by the defence ministry, but it would still remain operationally independent. "Our combatants will be well-armed from now on, as up until now equipment was supplied by volunteers," said Artem Skoropadskiy, quoted by the AFP news agency. Still, with Mr Yarosh now a part of the general staff - but crucially not in a deciding role - he and his fighters may now be subject to a degree of oversight. And the volunteer battalions in general may now be better controlled by those who, by law, should be in charge.